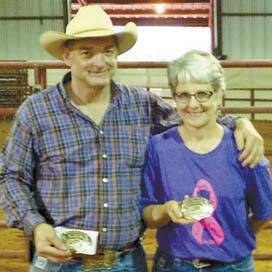 Buckle Winners of Pick Class at Sorting Out Cancer – Jim Birdwell, Wheeler, TX and Marva Karber, Cheyenne, OK. The Sorting Out Cancer held at the Red Barn, south of Cheyenne served 150 people on Saturday, May 21, 2016 and raised $5,300 for the American Cancer Society Relay for Life. There were 130 teams entered in the open and youth sorting. “We would like to thank all the donors and supporters who shared the day with us,” stated Marva Karber, event coordinator. “Most of the winners gave back their money and we all enjoyed a great day together,” she added.